Hundreds of farmers, chicken company employees, representatives of allied businesses, and friends of the Delmarva Peninsula's chicken community gathered in Salisbury, Maryland for the Delmarva Poultry Industry, Inc. (DPI) Booster Banquet, the 1,800-member trade association's annual membership dinner. 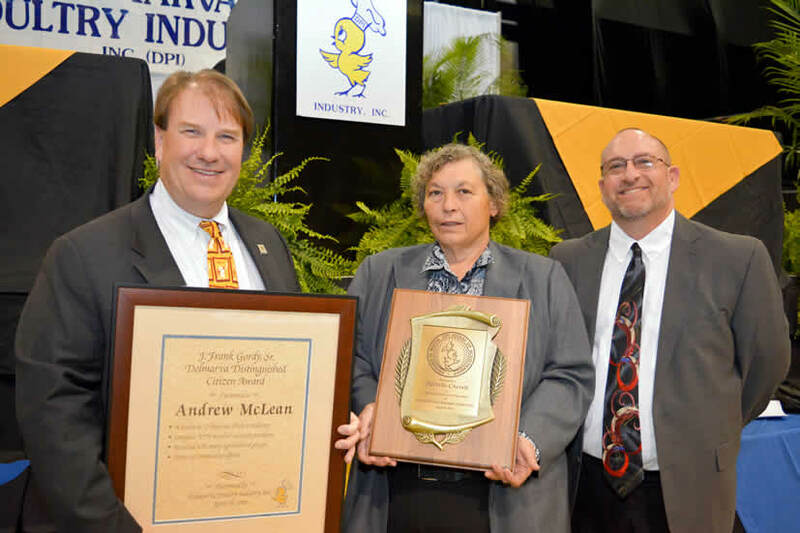 During its 62nd banquet, DPI honored two individuals for their work on behalf of the chicken industry and recognized 12 outstanding chicken growers for their excellent performance and stewardship. The J. Frank Gordy, Sr. Delmarva Distinguished Citizen Award, DPI's highest honor, was presented to Andrew McLean. An "organic chicken rancher," as he cheerfully describes himself, McLean is deeply involved in industry and community activities. He is a board member of the Harry R. Hughes Center for Agro-Ecology, Inc., and is chairman of the Delmarva Land & Litter Challenge, a group of industry, government, university, and environmental persons who are working on a consensus-building approach to develop solutions for poultry-related issues. A Maryland native, McLean worked for banks in agricultural lending for 28 years. He often hosts tours of his farm for groups and individuals seeking to learn how chickens are raised on Delmarva, and he was a trustee of the Maryland Family Farmers Legal Defense Fund when the community rallied to raise money for a Worcester County farm family when a misguided lawsuit threatened them. He is active in DPI leadership, serving on our Executive Committee, Environmental Committee, Grower Committee and Government Relations Committee, and he is a past president of DPI as well. A graduate of the LEAD Maryland program, he has served on the Maryland Agricultural Commission, is a past president of the Queen Anne's County 4-H Park Board and is a past president of the Ruthsburg Community Center. He and his wife, Kellee, live in Ruthsburg, Maryland. The Edward H. Ralph DPI Medal of Achievement was presented to Michelle Chesnik. A tireless watchdog and advocate for the chicken community, Chesnik worked in the banking industry in Baltimore before she and her husband, Paul, decided to move to Wicomico County and bought a chicken farm, seeking a calmer place to raise a family. With a large network of contacts throughout Maryland and being well versed in chicken industry issues, Chesnik has been engaged on our industry's behalf in recent years by sharing thoughts with, and educating members of, the Maryland General Assembly through e-mails, in-person contacts, or via testimony at legislative hearings. She often attends other types of meetings to educate non-legislators about the chicken industry. She played a large role in discussions of Maryland's phosphorous management regulations, and she continues to be involved with legislative issues relating to animal antibiotics and air quality. Chesnik offered her farm as a site for a demonstration alternative use of manure project, and she has taken a particular interest in conservation best management practices. Aided by DPI and the Wicomico Soil Conservation District, she has established extensive grass and forest buffers on her farm made up of 29 different plant species, most of which she selected. Her farm is part of the Farm Stewardship Certification and Assessment Program that recognizes farms for outstanding environmental practices. She has been a member of DPI's board of directors since 2014 and is very involved as a member of our Grower Committee, Government Relations Committee and Environmental Committee. Left to right: Andrew McLean, recipient of the J. Frank Gordy Delmarva Distinguished Citizen Award; Michelle Chesnik, recipient of the Edward H. Ralph DPI Medal of Achievement; and Delmarva Poultry Industry, Inc. President Todd Baker at DPI's Booster Banquet in Salisbury, Maryland, April 18, 2018.